Before the Virginia football team’s trip to Atlanta to take on option-based Georgia Tech, UVA coach Bronco Mendenhall detailed the need for a balanced and successful approach from all three phases of the team. The Cavaliers didn’t get that Saturday and ultimately fell 30-27 in overtime. 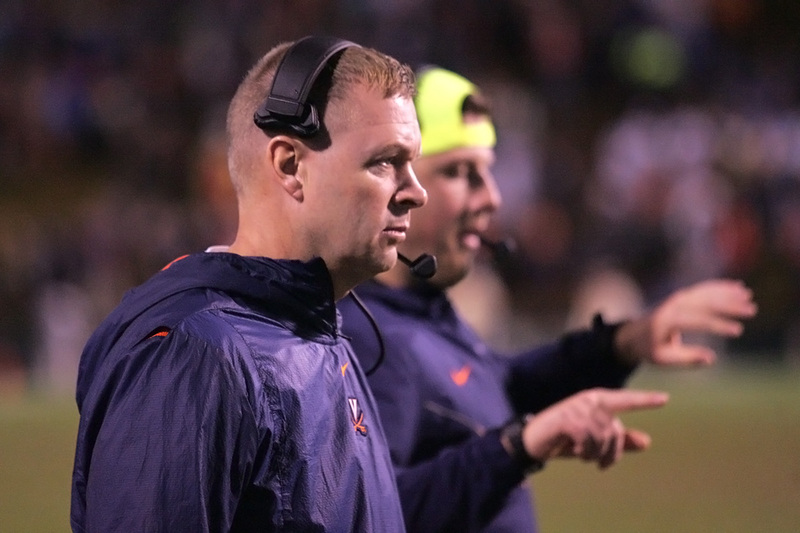 The shared burden between defense, offense, and special teams meant the Hoos’ defense needed to hold its own against the nation’s top rushing offense and then stop any Tech drives as field goals. The visitors got that done, holding GT to 268 rushing yards and 305 total yards while forcing the hosts to kick four field goals. The D allowed just one offensive touchdown. Virginia didn’t get what it needed elsewhere. For the special teams, those units gave up a 77-yard touchdown return following a safety and saw a tumbling punt bounce off of blocker Darrius Bratton for the game’s only turnover, which set up Georgia Tech’s only touchdown on offense. Lastly, after kicker Brian Delaney tied the game late in the fourth quarter with a 32-yard kick to help send the contest to overtime, he missed from 35 yards in the extra session and that ended the game. On offense, the Hoos left some points on the table too. While they did get into the end zone twice inside the red zone on a 13-yard catch by Hasise Dubois and a 9 -yard run by Bryce Perkins in the first half, they settled for field goals on three other trips inside the Georgia Tech 20-yard line in the second half. The first time, UVA moved to the GT 14-yard line where it faced 2nd-and-2. The second down play came up with just one yard on a Perkins’ run. On the 3rd-and-1 play, Perkins tried to find Joe Reed in the end zone but missed. That drive ended with a 30-yard field goal make by Delaney. The second time came in the game’s final minute with the Cavaliers trying to pull off a last-minute drive to win. They took over with 56 seconds to go and moved the ball all the way to the Tech 9-yard line following a Perkins’ 12-yard run. UVA lined up with the chance to spike the ball with the clock restarting at 14 seconds on 1st-and-Goal, but Perkins opted for a fake spot and took a shot toward Dubois in the end zone. That play failed and the Hoos only had enough time remaining to kick a field goal. Delaney delivered to send it to overtime. The third time started at the 25-yard line per overtime rules. Virginia gained four yards on a short pass to Olamide Zaccheaus on first down and three yards on a run by Perkins on third down. The Cavaliers tried the tying field goal on fourth down, but Delaney’s kick sailed sideways from 35 yards and missed wide left. As a result of the missed opportunities on offense and the miscues on special teams, Virginia fell to 7-4 on the season and 1-2 in games decided by a touchdown or less. The Wahoos topped Miami 16-13, but fell 20-16 at Indiana and then by three in Saturday’s overtime game. They’re 4-5 in games decided by a touchdown or less in the Mendenhall era, going 0-3 in his first year and 3-0 in his second year. Those two close losses are part of what cost the team a shot at the Coastal Division title this season, but the Cavaliers still secured back-to-back bowl bids for the first time since 2004-2005. A shot for a special season, however, has not completely evaporated. That’s because the rivalry game with Virginia Tech is up next on Friday. The Hoos have a chance to snap a 14-game losing streak to the Hokies and finish 8-4 in the regular season. Virginia may need to do a better job with some of the critical plays it missed against Georgia Tech to make the finale one to remember.